It’s not always easy to keep everyone happy over Christmas, especially when there is family involved. Invariably, children just want to be at home, playing with their new toys, yet parents often have the annual issue of which set of parents to visit, with many stressful hours spent driving up and down motorways. For those people on their own, or with family circumstances that don’t lend themselves to hordes of happy invitations to spend Christmas together, it’s also a time to ensure they feel part of something at Christmas, rather than lonely or isolated. 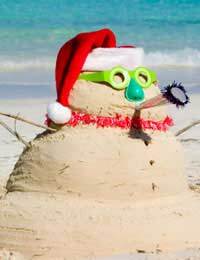 Whatever your situation at Christmas, you’re sure to recognise that feeling of ‘next year we’re going to be on a beach far, far away at Christmas instead of all this hassle!’ Rather than leaping to make a decision that may possibly upset your parents, cost you a fortune or both, take the following thoughts into consideration. Where to Go? Who to Go With? Think about the type of day that you want, and then work backwards. Think about who you will be with, or would like to be with – your partner, children, friends, total strangers….and this will help tick some options off your list. ‘Going away’ can mean booking a Christmas weekend at a fancy hotel or going all out for a change of scene with a holiday on the other side of the world. If you feel like you’ve had a terribly stressful year and just want to be pampered over Christmas, you may not be bothered about all the Christmassy stuff that’s part and parcel (excuse the pun!) of Christmas in the UK. An all-inclusive beach holiday may be just the thing you need to get the spring back in your step in time for the New Year. If, however, you just want a change of scene, but don’t want to do something totally different and miss out on a ‘traditional’ Christmas, then maybe all you need is to book Christmas dinner in a local hotel to save you the stress of the day. It can be expensive, but it really is a lot easier and do be sure to get recommendations, so you don’t feel like you’re wasting good money on dry turkey and soggy sprouts. ‘Oh, I thought you were cooking for the whole family again this year' - while thinking - 'in your small kitchen, while we put our feet up and drink sherry’. It seems to have become part of the Christmas tradition in many families that there is a tense conversation around the end of September where your mother and/or mother in law will ask about your plans for Christmas. Of course, what they really mean is that you will upset and disappoint them if you don’t say you’re planning to visit them on the big day. If you’ve decided that you’re going away for Christmas – whether it’s to a local hotel or a sun-drenched beach – the best tip is to tell your family as soon as possible. And note the word ‘tell’ – if you ‘ask’, you’ll be more likely to get the guilt trip. Say it nicely though and try to offer something that will soften the blow - like a family party - with an easy to organise buffet in the New Year. Try, “I wanted to let you know that we’ve booked a table at a country hotel/trip to New York for Christmas. We’re really excited about it and it’ll give you plenty of time to make plans for yourselves. Of course, you’re welcome to join us, here are the details of the hotel (only say this if you mean it, or it may come and bite you!) but if not, we hope to visit you in December to swap gifts.” . If you make sure to involve your family and spend time together over the holidays, or at least have plenty of phone calls (video calls are even better) if you live miles apart. Send a thoughtful gift too and you shouldn’t be made to feel too guilty!